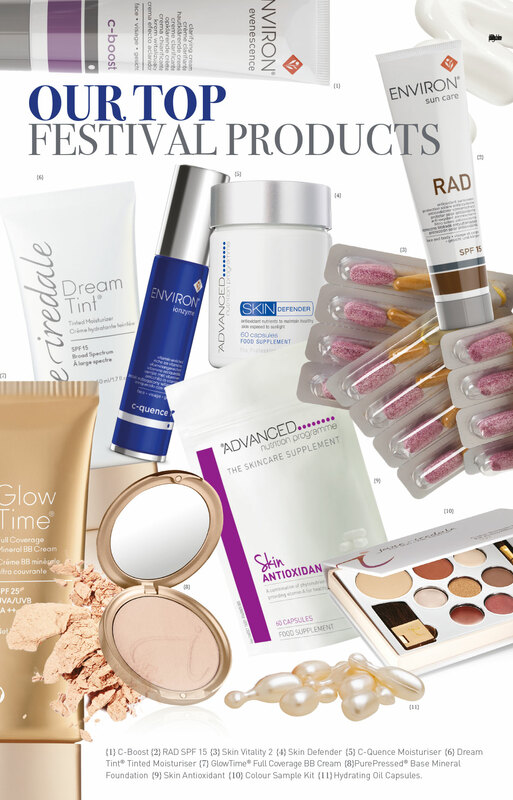 Festival Season is BEAUTY SEASON | iiaa Ltd | The UK and Ireland distributor of Environ Skincare, jane iredale makeup and Advanced Nutrition Programme. According to the Skin Cancer Foundation, more than 90% of the visible changes commonly attributed to skin ageing are caused by the sun. With the summer event season off to a running start, whether you're enjoying a day at the races, wandering through floral displays at Hampton Court or Tatton Park, cheering your favourite at the tennis, or attending your favourite festival - everyone will be exposed to the sun in some way. While exposure to sunlight is vital to the production of Vitamin D for healthy bones and teeth, UVA and UVB rays can be harmful if allowed to turn into damaging free radicals. So now is the time to give your client the Feed, Fortify, Finish™ treatment.